Thoth Dates: April 1 – 19, November 8 – 17. 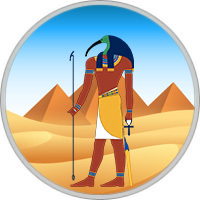 Traits of Thoth people: Compassionate, Energetic, Courageous. Lucky Colors: Pink for men, White for women. Associated Zodiac Sign: Virgo ♍. God Toth taught people speech, writing and mathematics, and became the patron of scientists, philosophers, agronomists, scribes and bookkeepers. When making exact calculations, for example, astrological, the priests and magicians called upon his strength. Possessing deep wisdom, he was an adviser to Osiris and a mentor to Horus. On the images he appeared with the head of an ibis, decorated with a month. Children of Thoth have a tendency to any calculations, they are always logical, attentive to details and punctual. They can be relied on, since they always keep their word, are very responsible. They have a wonderful memory, using which, they analyze their life experience and develop their own successful strategies and principles. These people are easily given hypnosis, especially if their eyes have a green or brown hue. However, gray-eyed favorites of Thoth can easily learn to suggest. Most often they use this unconsciously, and therefore can always convince a person and persuade him to his opinion. They also easily distinguish truth from lies. These people are modest, but charming. Honest and able to endure the blows of fate, without complaining, with his head held high. They treat money with respect, trying to save a certain amount for a rainy day or to ensure a comfortable old age. In love, they are devoted and selfless, they try to provide the best partner, hide their shortcomings. They can be somewhat cold, but they are attentive and generous. Men of this sign possess the gift of persuasion, they are able to persuade anyone. It’s enough just to look into the person’s eyes, as if you are trying to hypnotize him. Their curiosity, enterprise and determination can only be envied, the Thoth man always rushes into the pool with his head, and strive to comprehend the unidentified. Honest and generous personalities who behave very modestly in any situation. They heroically assume all the blows of fate and confidently go forward. A woman born under this sign, adapts quickly and gets used to everything new. The Thoth woman is able to give correct instructions, from it a good teacher will turn out. A real careerist who likes to go to work with pleasure. She chooses a profession, listening to the call of the heart. Choosing the future of the chosen one, the female representative does not show her flaws. She skillfully manipulates, and strive to win people’s confidence. Around such a person there are always many admirers, but she is ready to wait for that same man who will become the ideal companion of life.